Nothing new here, but eating for pleasure may be the healthier way to eat. No counting calories, no weighing your food and no fad diets. First, let’s make it clear that eating for pleasure doesn’t mean eating whatever we want, whenever we want either. You can’t have cake for breakfast, poutine for lunch and pizza for dinner every day. If we define eating for pleasure as eating foods high in fat, salt, and sugar, we’re missing out on what the food world has to offer. Eating for pleasure should not only let us explore and appreciate foods, but also give us the nutrients we need (fruits, vegetables, whole grains, quality protein and fats) to a live a healthy life. 1. Focus on feeling great. Will this food make me feel good while eating it? Will I feel good 30 minutes after eating it? Will I feel good tomorrow, in 2 days, a week from now? If the answer is yes to all four of these questions, then go for it. If the answer is no to any of these, then it’s time to have an honest conversation with yourself about why you are eating now, why you want that food, what emotions are you feeling, etc. Put the focus on feeling great rather than trying to fill a void that can’t be satisfied with that chocolate cake. Go to the market, get into the kitchen and create something. It doesn’t have to be anything elaborate; it can even be simply cutting up some veggies. Being in the kitchen to prepare something made with TLC is really important in creating a positive relationship with food and makes you enjoy your food even more. Want to kick it up a notch? Grow your own food! 3. Accept enjoyment/pleasure from food. I love food and so should you. If you accept foods for what there are, there is a smaller chance that you will feel guilty afterwards. There are no good or bad foods either; it’s all a matter of quantity. Too much water can kill us (don’t be scared, it’s something like 6L in an average person), but that doesn’t mean we have to stop drinking water. Same applies to foods that are high in fat, sugar and calories. There’s absolutely no problem eating an enjoying these foods if it’s once in a while. 4. Skip the “diet foods” (unless you love the taste). Love those snap pea crisps? So do I! But I don’t eat them because they are low in calories; I buy them because I enjoy the taste. Low-fat and low-carb foods usually contain added sweeteners or fillers to make them taste better anyway. You can eat the real stuff in adequate amounts and stay healthy and feel good. You know that stereotypical tiny portion we think of when we think of a fancy restaurant? Well it’s not a tiny portion, it’s the correct portion. A serving of protein at meals should be about the size of the palm of your hand or 3 oz, and this is true for almost everyone. This is what is typically served at that fancy restaurant. That 10 oz steak at the chain restaurant is easily 3x the suggested portion, so reconsider what portions you should really be eating. No TV, no phone, no computer. This removes the pleasure and experience we get from a traditional sit-down meal. We even sometimes forget that we are eating and either eat more because we are not listening to our satiety cues or grab more food because we are not satisfied. Why don’t you pretend to be a food critic once in a while and notice all smells, textures and flavors in your food? Won’t I overeat if I eat for pleasure? Not if you enjoy other facets of your life and not if you are eating something you really want and are hungry for it. Ever order a pizza that didn’t really hit the spot? That’s because either the pizza itself wasn’t great or you’re trying to fill a void that can’t be met with food. So what happens? 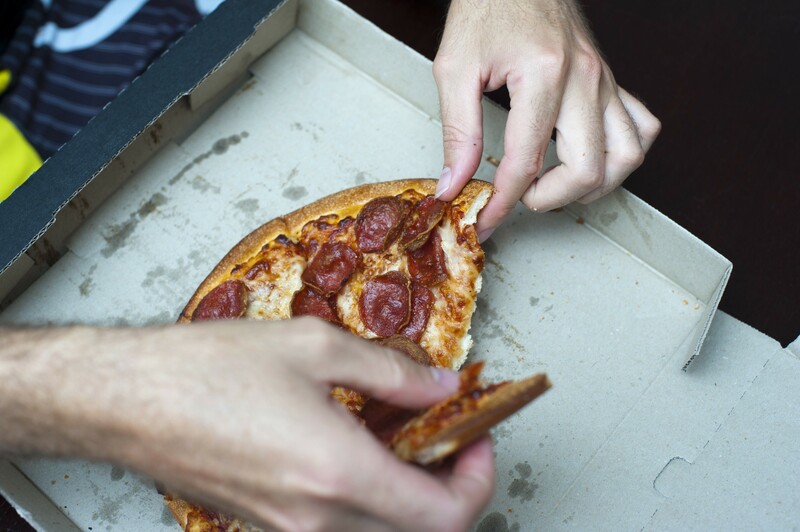 You eat more because you are trying to satisfy feelings that cannot be fulfilled with that takeout pizza. So make sure that you’re in the mood for food (as opposed to emotional eating) and that the food tastes amazing. Paddon-Jones, D., & Rasmussen, B. B. (2009). Dietary protein recommendations and the prevention of sarcopenia: protein, amino acid metabolism and therapy. Current opinion in clinical nutrition and metabolic care,12(1), 86. You’re right, a lot of it is habit, which is why it’s so difficult to change. You have to be patient and create new healthy habits! You know what I find strange. When I am in a good exercise regime, I tend to watch more my portions than when I am out of it. Why is this? It’s probably because you don’t want to sabotage your exercise efforts. Or sometimes we start exercising to reach a certain goal, and watching our portions helps us attain it!